I had tried a similar strategy earlier and it worked. Then, queens were tried in varroa infested areas, before the Varroa arrived in my area. And I could bring back valuable breeding material in the form of pieces of combs with young larvae to graft from. 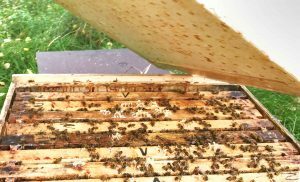 Obviously, good bee colonies in the Elgon are many enough and have now helped each other to keep down the Varroa pressure in the surroundings. Individual colonies with maybe too many mites have not been able to start strong domino effects by contributing too much of reinvasion of mites. 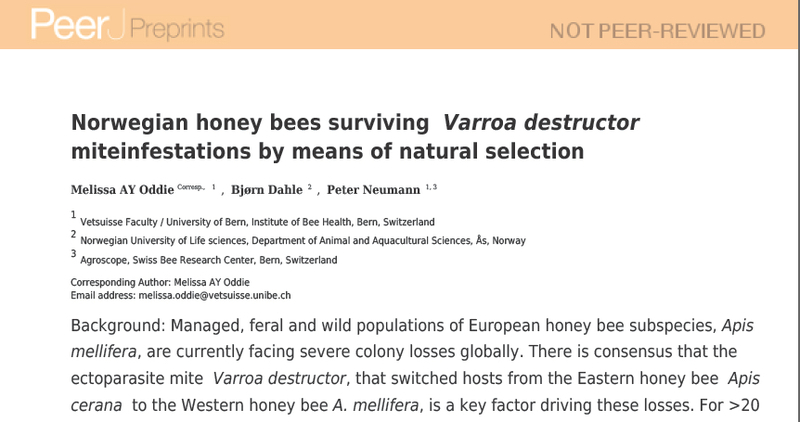 Reinvasion brought about by more resistant colonies who silently rob those being richer in Varroa mites. 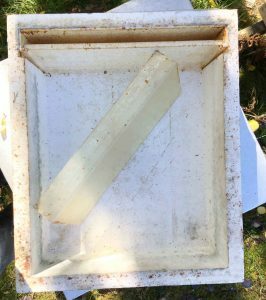 A couple of years ago, we also began to be more careful making bee shaker test and treat as soon as varroa levels were higher than 9 mites from 1 dl of bees, at least (about) 300 bees. Checked at least spring and summer. This has resulted in a very nice result. An area (about 15 x 10 km) in the center of the entire elgon area (about 50 x 10 km) which contains about 350 elgon colonies (in the center area) of good quality, and no other types of bees. 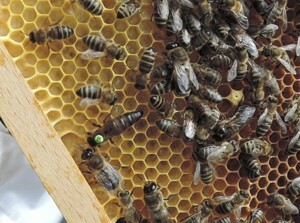 Here, most of our queens are mated. Only about 50 of these colonies needed to be treated against varroa this year. There are probably more than 900 elgon colonies in the entire elgon area. Most of them has Thomas Dahl with 300. Johan Ingjald is increasing his numbers. 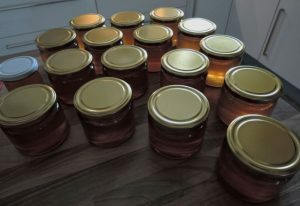 There are several engaged new beekeepers going up in numbers. Stig-Åke Gerdvall and Johan Ingjald (TBH-expert) hold beginners courses and queen breeding courses in our local association. 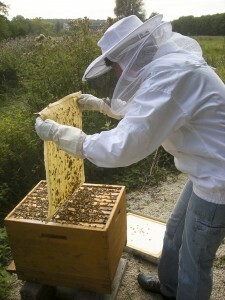 They help the participants to get new good colonies, and to help them find good places to mate their new virgin queens. We have also organized a mating site for mini nucs which Peter Tesell manage. The annual losses are about 10% in the area. The harvests are good, and of course, vary with the availability of nectar in the various parts of the area. To the east, it is a problem to produce low crops due to the rich soils. We usually meet in Nov-Dec every year and talk about the season and planning the next. This year we are so many so we gather in a bigger locality in Hallsberg. Anyone interested is welcome. Four lecturers. 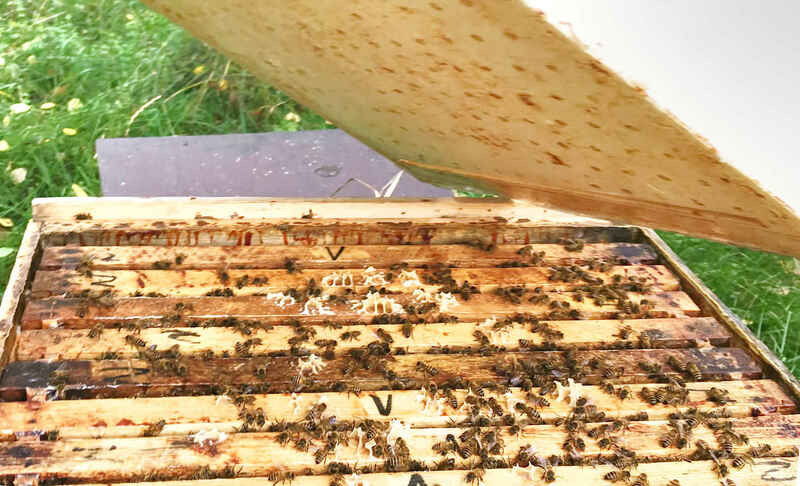 Lessons from feral bees – R Gavlovsky, Knowledge from TBH and Warré – J Ingjald, Possibilities of the Beescanning app – B Lagerman, Tips for breeding resistant stock – E Österlund. Cooperation works well! Dave was probably the one who was the first to stop treating. Then Pete stopped. He is a bee inspector. He had a lot of losses initially. He knew there were feral (wild) bee colonies. He observed that they stopped giving swarms when the Varroa came, but all feral colonies didn’t die. Some lived on, and after 3-4 years, they began to give swarms again. Clive stopped to treat because Apistan stopped working in 2004. Pete now focused on capturing swarms from feral bees. Then his bees survived better. Others split the colonies that survived Varroa best and had small Varroa populations. 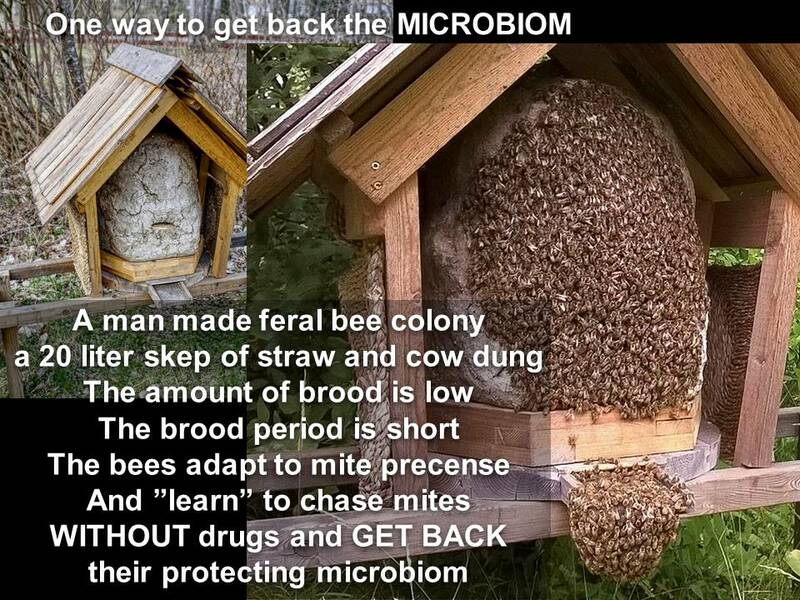 They provided new beekeepers with such new colonies. And the number of treatment free beekeepers grew. Many of them don’t feed sugar but let them live entirely on honey. 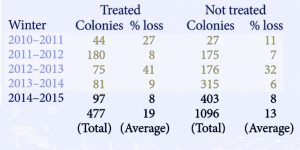 They keep the number of colonies in apiaries low. Pete has maximum 5 in each apiary. 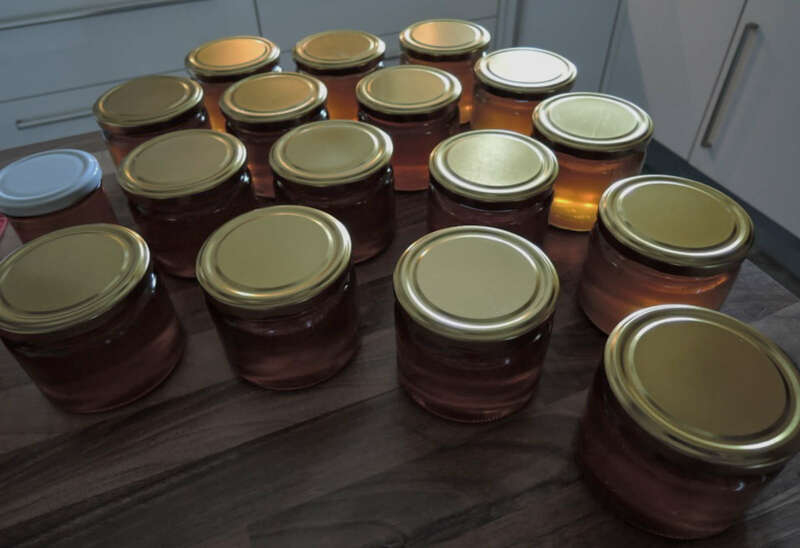 With his 60 colonies he harvests his 2 tons of honey to serve hos customers. 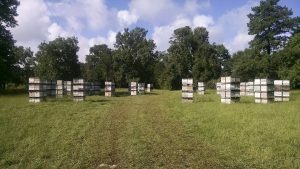 In 2010, they began to wonder how big the differences in losses were between those who treated and the treatment free beekeepers, so they asked around. The first line of numbers in the table is from the winter of 2010-2011. The last line is a summary of five winters. If you make splits, make it from the best colonies and let the bees make new queens. The colonies that are not fit enough die (or are requeened, if not by the beekeeper, by the colony itself). No mating station with sister groups producing drones is used. All survivors are producing drones for mating with virgin queens. 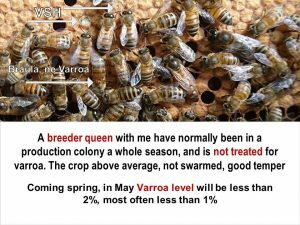 The result showed that the varroa population of the test bees had a growth rate of 0.87, ie a decrease over time. While the non-resistant control colonies had a growth rate of 1.24, i.e. an increase of the mite population over time. 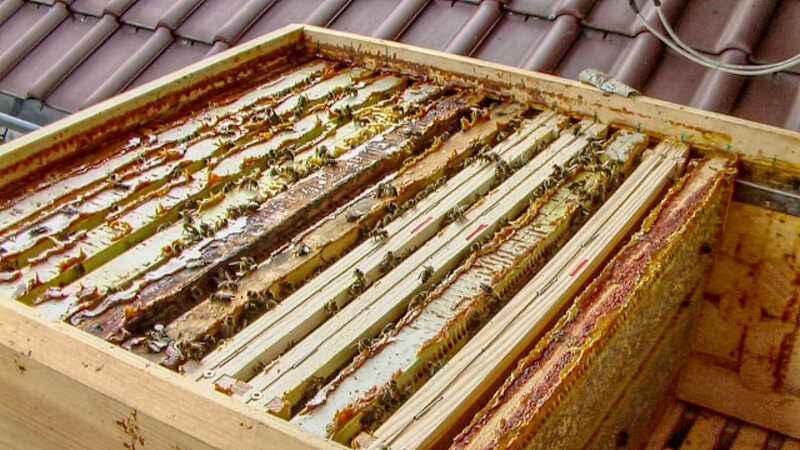 One of the beekeeper’s own apiaries was used and its colonies were used in the test.. Thus, no queen was introduced to other types of bees in another place. The resistant bees and their queens were tested in their normal environment. The distance between the test and the control colonies were big, 60 km. The name of the beekeeper. He had earned a place among the authors. 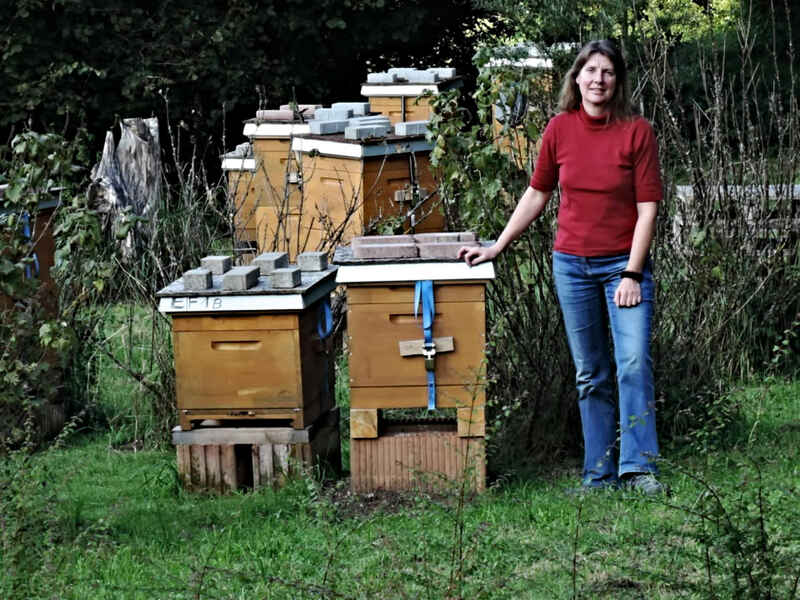 The beekeeper has exchanged breeding material with another commercial beekeeper since 2004. This beekeeper has also not been treating his bees for many years. 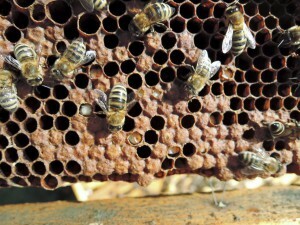 The number of bee colonies forming the resistant colony population is not mentioned. 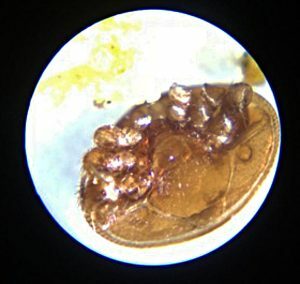 The cell size used by the beekeeper is 4.9 mm, ie small cellsize, for almost as many years as he did not treat against varroa. The cell size of the control colonies is also not mentioned. Is it also 4.9 mm or larger? 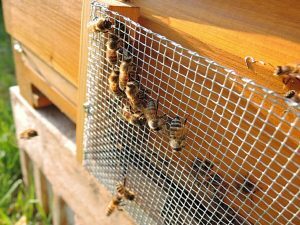 It is not mentioned if there are other bees close to the test and control colonies. 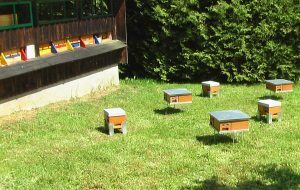 The test beekeeper has several apiaries. If any of them are near the test apiary, it would probably not affect the test. How many other type of bees could be found near the test and control apiaries (if any) is not mentioned and, if so, the distance to these bees. It is important for the reinvasion risk. Nothing is mentioned of annual losses for the years backwards for the test and control colonies. It may be of secondary significance and these figures may also not have been secured. However, some kind of data about of the losses at the beginning of the adaptation of the test bees could have been interesting to take part of. But the article is inspiring anyhow. 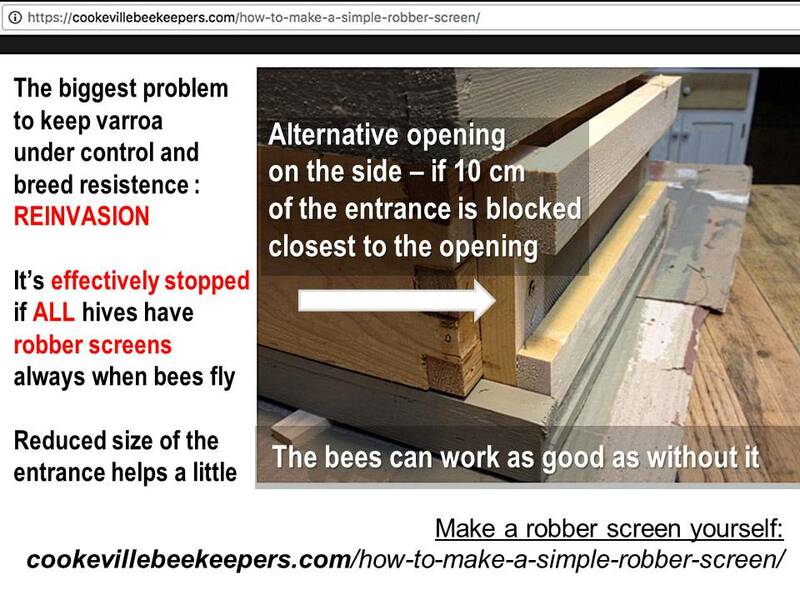 There are also no tips for beekeepers inspired by their article to start developing their bees to become resistant. Of course, it is not a task of the test I understand, but some kind of comment about this has been positive since many beekeepers will certainly appreciate the article and be inspired by it. However, such advice I look forward to find in follow-up articles in bee magazines. A few days ago I removed the last feeder after giving the colonies complementary sugar solution for winter feed before too low temperature arrives. Colonies surprised me being so calm I could speed up the work by bashing the feeder onto the hive in such a way that the bees sitting in the gate (by which they used to reach the sugar solution) fell into the open hive. 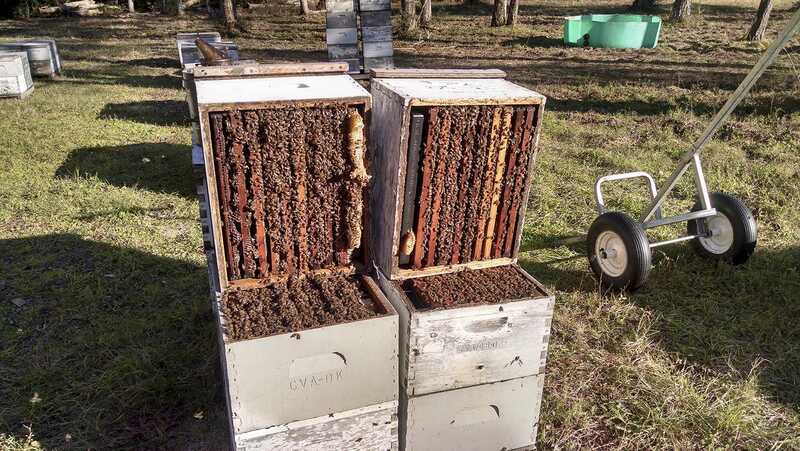 The feeder was bashed on the hive in such a way the bees fell into the hive. This is not a normal way to rid the bees from the feeder. But these bees didn’t react, which made me happy. 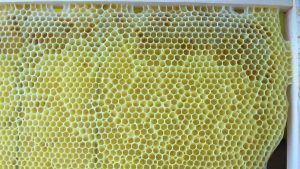 A normal hive you shouldn’t treat like that for the risk arousing their temperament in a very bad way. They could start chasing yourself and all that are around you as well as neighbors. I soon realized the bees didn’t care and I was both surprised and glad of course. This colony on the pictures is a split from one of my breeders this year. 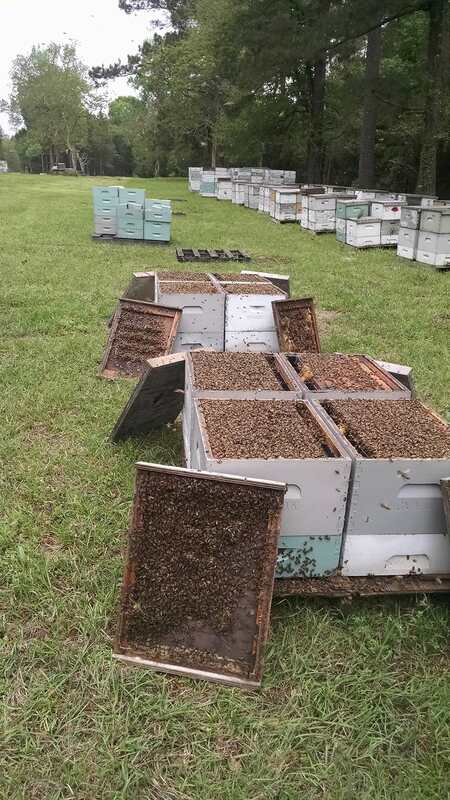 It reared their own queen, grew quickly in strength, gave some honey and ended up on three 12 frame square shallow boxes for winter packed with bees. The breeder colony is on its third season without any treatment of any kind and had a varroa level of 0% in May. The temper was good, but the temper of the split is even better, not a bee flying up at this bashing treatment. And no sign of any virus problems. In spring I will monitor the varroa level in this one and several others. 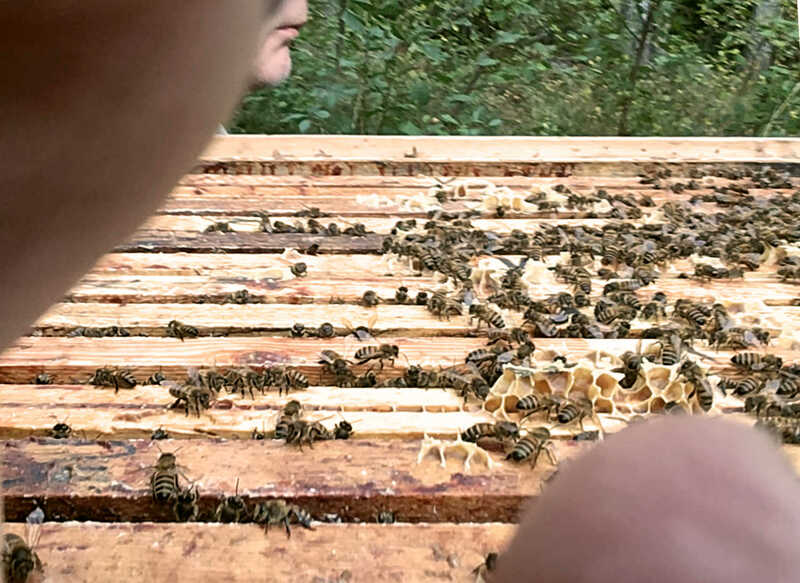 I tried to take a selfie together with the colony just after the bashing, but it wasn’t that easy to get a good shot with one hand. But you see a little anyway. 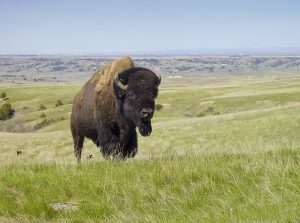 South Dakota is Buffalo and Indian land in the northern part of the Midwest. I talked to Chris Baldwin some time ago. He is a commercial beekeeper running about 1500 bee colonies. 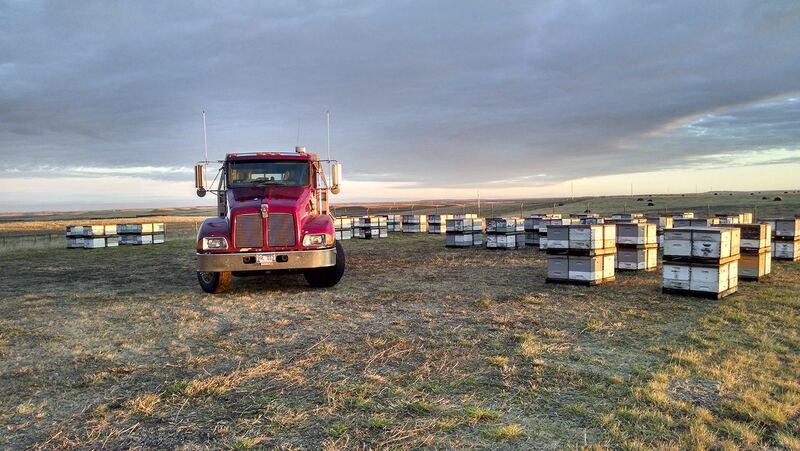 In summer his bees are closer to his home in South Dakota. In February they pollinate Almonds in California. After that they are going to east Texas for queen breeding and splitting. Focus in handling the mites is not eliminating the mites, says Chris. It’s eliminating susceptible bees. Chris hasn’t been treating his bees against mites for more than ten years. Last Coumaphos 2003, Only Oxalic 2004 and 2005. Nothing in 2006 and finally Thymol in 2007. After that nothing. He’s loosing bees yes, but not because of mites really. He’s keeping bees like bees were kept before the arrival of the Varroa mite. When he talked to another commercial beekeeper recently, his comment about Chris’ bees was that they probably could handle all farmers chemicals better as they didn’t had to deal with miticides as well in their hives. 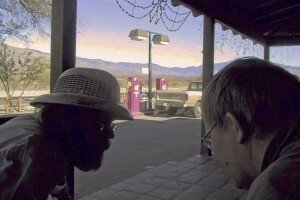 When he shares his experiences with others he is many times surprised of the response, or lack of response. Maybe some think he’s earning money on selling queens from his “pretended varroa resistant bee stock”. Maybe because almost all(?) scientists say you must treat against mites to get your bees to survive. But Chris don’t do that. He lives on his bees producing honey and pollinating crops. There are so many examples now of treatment free operations for many years that we can write down a working plan to produce resistant stocks. 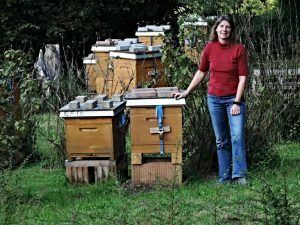 It’s not telling the whole truth leaving out the growing number of treatment free beekeepers and their working plans for their success. When he talks to scientists, many well known, about his bees, they look kind of strange in silence for a while and then walk away. They don’t show up at his yards wanting to investigate his bees and methods to find out more, as you would expect. 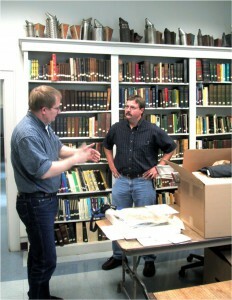 Chris has good references, the bee inspectors in his areas in South Dakota and Texas. Once he had a columnist from a bee journal showing up asking and looking at his operation. I’m sure the readers would have loved to know more about how Chris is managing his bees. But he’s doing many things the opposite way to what many times is preached from the front. No wonder he said to me he feels like he’s blacklisted. By whom and why, if that’s the case? After some additional communication with Chris about his operation the picture gets more clear and gives more food for thought. It’s really interesting and valuable to put his experiences and management system beside others’ to get a better understanding of our fascinating honey bee and what it means to us as an economic resource and understanding its role in nature. 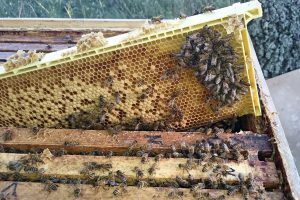 Chris may well be the only big commercial beekeeper focused on pollination services that is treatment free when it comes too the Varroa mite. 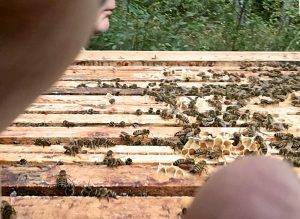 His bees are exposed to agricultural chemicals, drifting of other beekeepers’ bees into his colonies (which may well bring mites and pathogens of different kinds) and his bees visiting weakened hives to rob from (and pick up mites and pathogens). It’s not difficult to understand that his bees might well have problems due to this. Pathogens like nosema, plus chemical residues from spraying of the almonds for example and extra mites and viruses picked up will make life hard for the bees when they go back east Texas in March after almond pollination in California. 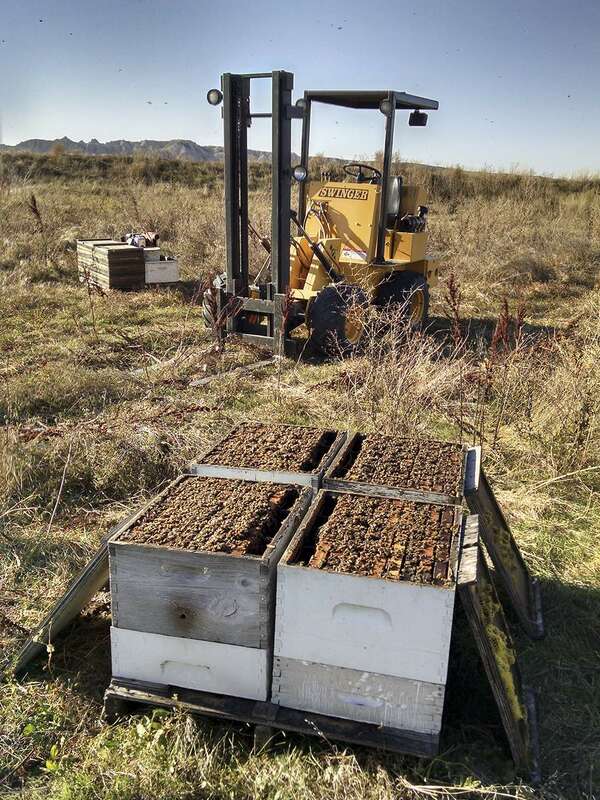 After pollination in California the bees go to Texas, here ready for supering. 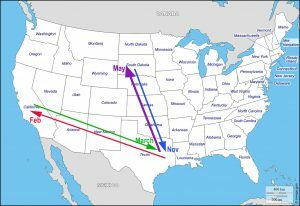 The colonies return to Texas in late March. There they are supered for growth and maybe honey production. April flows in Texas are unpredictable. Not all colonies went to California from Texas February 1 for pollination of the almonds. 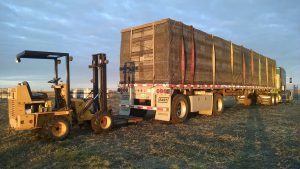 The remainder are scattered to out yards for buildup and also prepared for cellbuilding, which begins in early March in Texas. Nucs are made in March and April. Africanization is not a problem in east Texas and his number of hives is big. So his drones dominate the air well. Also there are few fives from other beekeepers in his area. 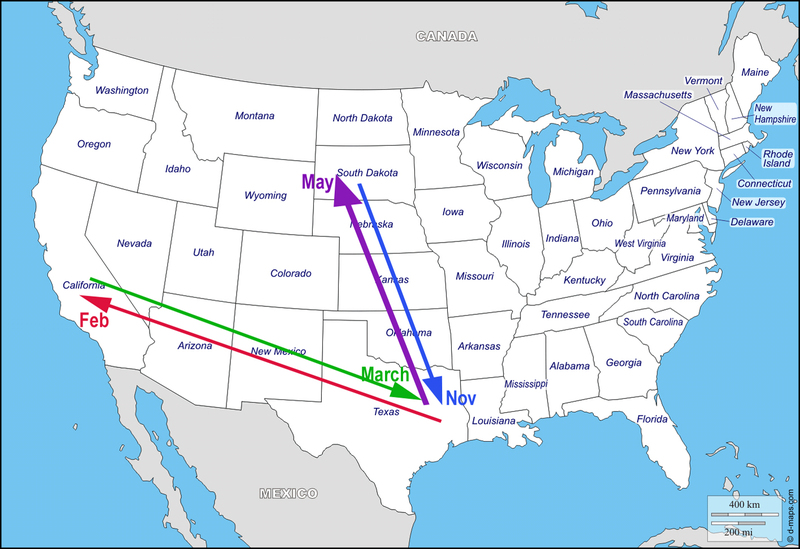 Preparing cellbuilders in early March with colonies that stayed in Texas when the main part went to California. 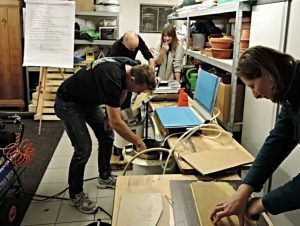 In a commercial operation every part in the system have to work good enough to make the system work and bring food on the table. One part that is maybe more critical than others is cellbuilding in the queen breeding part. European Foulbrood has grown to a persistent problem in America. 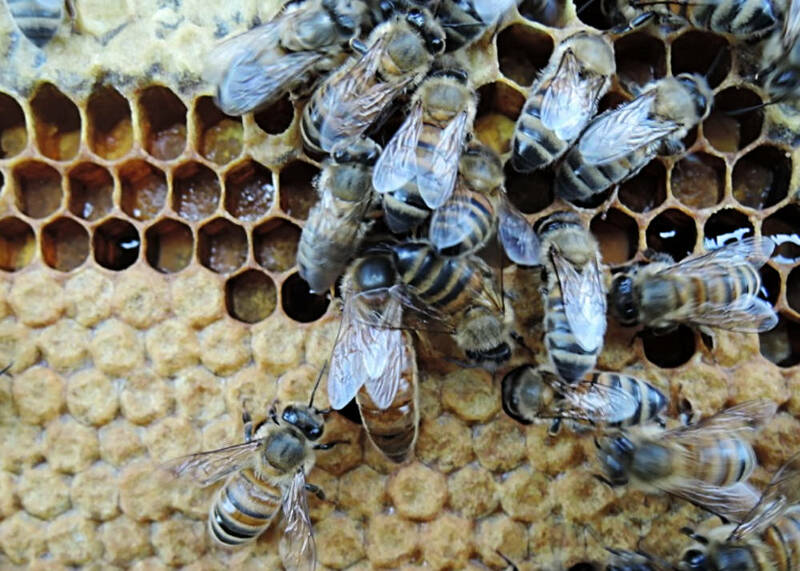 It may well bee due to increasing amounts of chemical residues in for example wax combs putting higher pressure on the immune system of the bees. 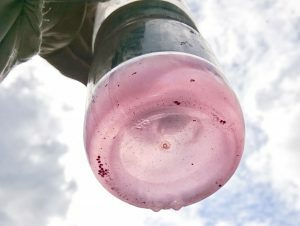 Chris will not have the chemical residues from miticides, which may well help his bees keep a better standard on their immune system than bees in other commercial outfits. Still he can during springtime at just the time of cellbuilding experience some problems from European Foulbrood. To be sure he will be able to produce the number of queen cells he needs, he gives the colonies involved some tetracycline in spring. That takes care of this problem efficiently. This is the only drug he uses. 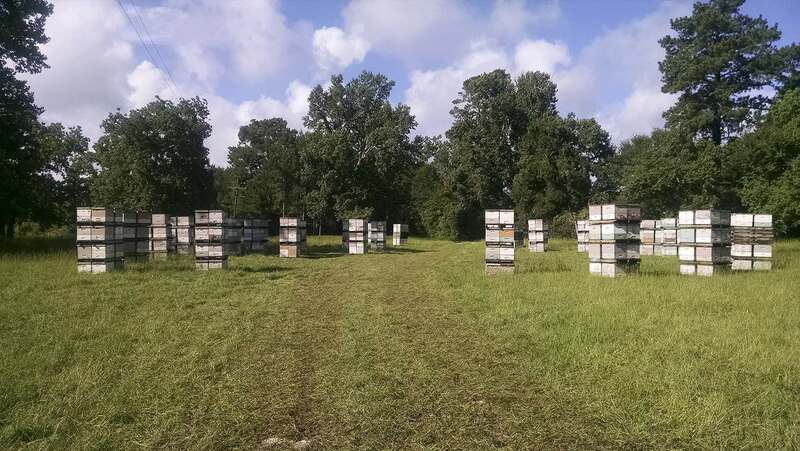 Colonies prepared for going from Texas to South Dakota for honey production during summer. 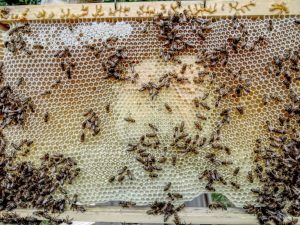 Colonies that have collected enough of honey for a food reserve are shipped to South Dakota for the clover flow, starting early May. Or they may stay in Texas longer for the Chinese Tallow tree bloom. It is often a difficult decision which will give the best flow. After harvest in October iSouth Dakota. Honey supers are removed. 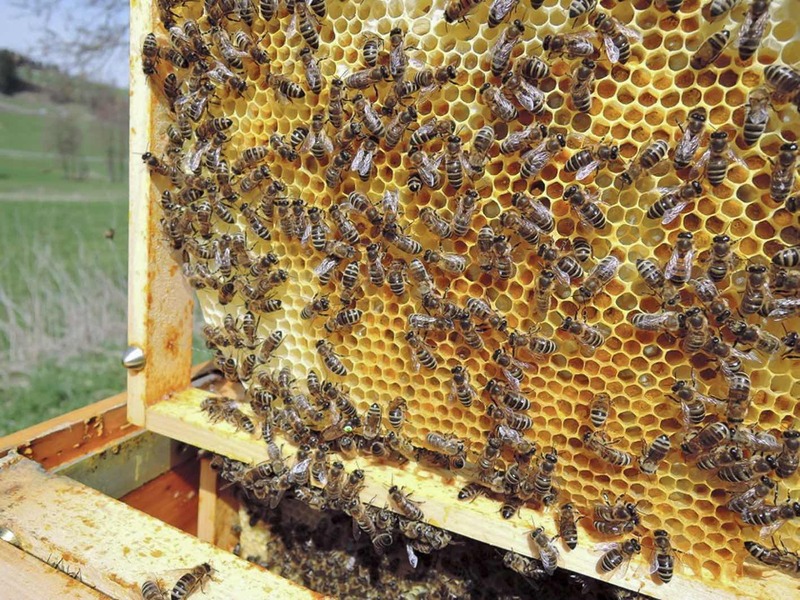 Harvesting of honey may begin in July and go through October in South Dakota. 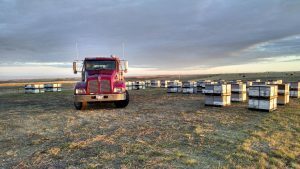 The bees are fed if necessary, then shipped to Texas early November, hopefully before the first blizzard in South Dakota. 544 colonies loaded for transport from South Dakota to Texas in November. 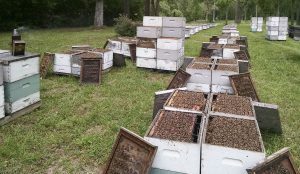 Another 544 colonies are waiting to be loaded. 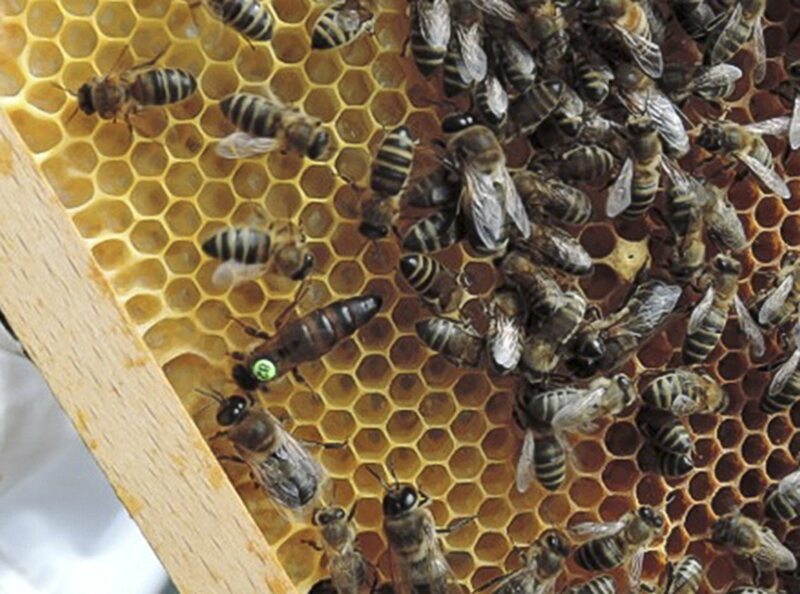 During summer about 20% of the colonies are lost due to queen problems. At least partly these queen problems may come from the rough circumstances in the pollination services environment. Pathogens and chemicals picked up there. In January the die offs are taken care off, as well as the bees alive. If necessary colonies are fed. Winterlosses and losses experienced after the almonds in California can together be 10-20%. This makes a total annual loss of about 40%, which these days is the average in America, wheather you treat against mites or not. Quite some years ago now Chris had a “CCD-year” with 70% losses. But weather was favorable and he could recover colony numbers from remaining colonies in one season. 40% losses is a little too high, but up to 30% are okey for Chris in his management system. Actually some amount of losses are more or less needed to weed out the worst colonies and multiply the best to improve the stock continuously and keep the numbers stable. Also to minimize the swarming through making nucs. He is not into selling colonies or queens. He gets his income from pollination services and honey production. 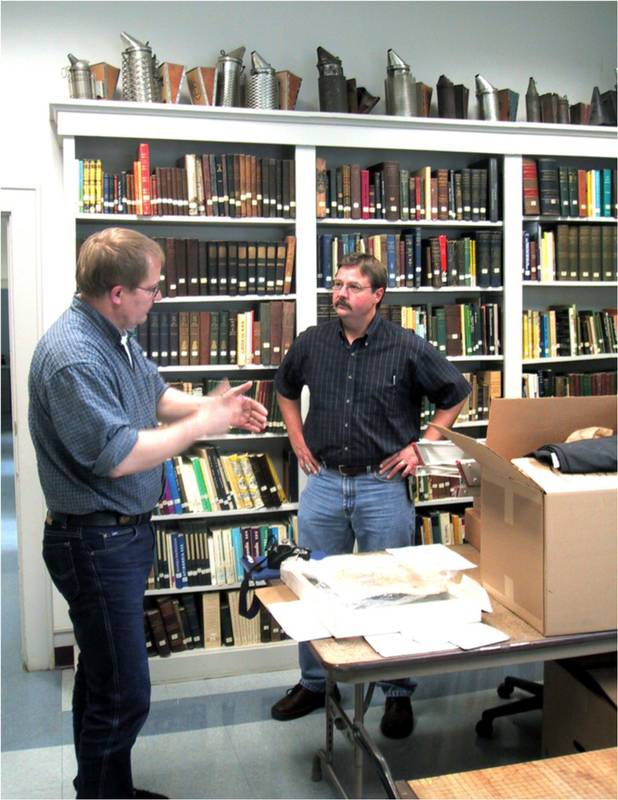 Beekeepers love to discuss different details in their management system. One is the hive configuration. 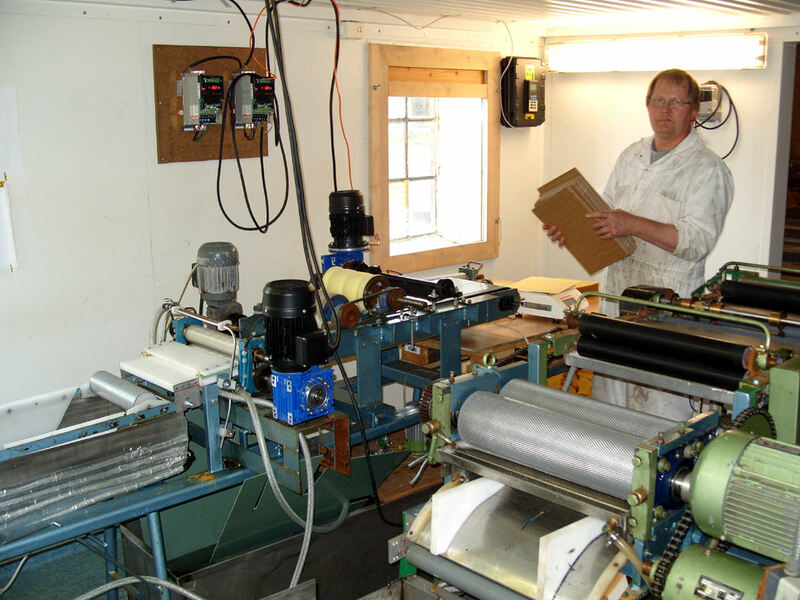 And you can have quite animated discussions going on concerning how good or bad this or that part is, for example 8 or 10 frame boxes and medium or Langstroth boxes. What you many times forget is that each part of a management system, including the hive configurtaion’s different parts, is a result of this whole management system in which each part fits well enough for the beekeeper. If you change one part, you may have to change also other parts to make the system work well for you. And special circumstances for you may play a role why you have chosen the solutions you use. Chris Baldwin uses a 10-frame system with a shallow box (5 & 11/16”; frame 448 x 137 mm) on the bottom. It is always there. It’s kind of an expansion space which the bees use as they want, more or less without control from the beekeeper. 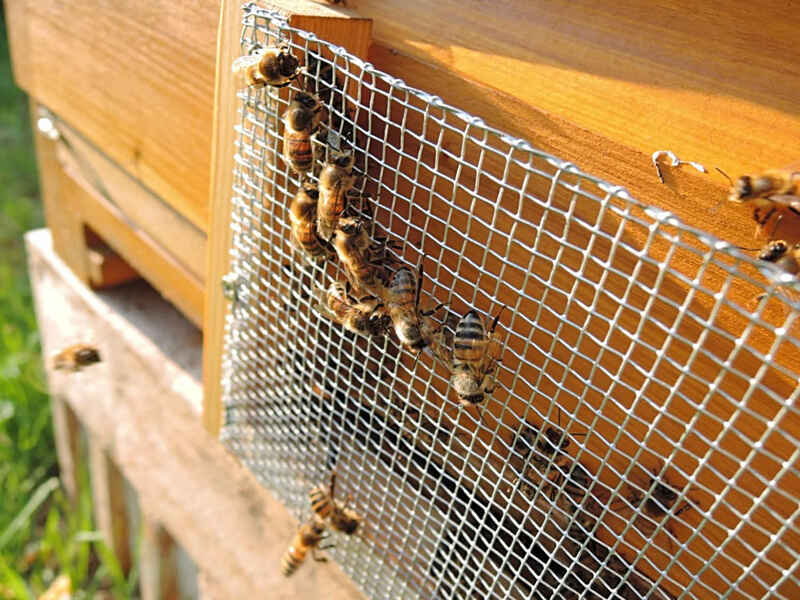 The bees remodel, tear down and build back, the combs in the frames there. Sometimes they are bad in shape, sometimes a lot of drone comb, sometimes good looking well used by the bees. The next box is a Langstroth deep with 9 combs (frame 448 x 232 mm) and a plastic division feeder. It’s tight, but that keeps out burr comb. When moving combs the feeder is first taken out to make space for easier handling. This is the broodnest all the time. Then comes the queen excluder. 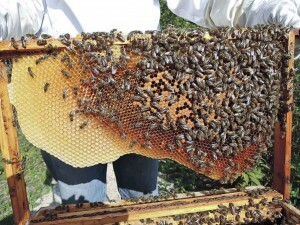 The supers are normally 8 combs in 10 frame deep boxes and medium boxes (the latter frame 448 x 159 mm) with metal spacers. Almost no plastic combs are used, but wired wax foundation in wooden frames, since many years. Colonies can grow very big on this set up. 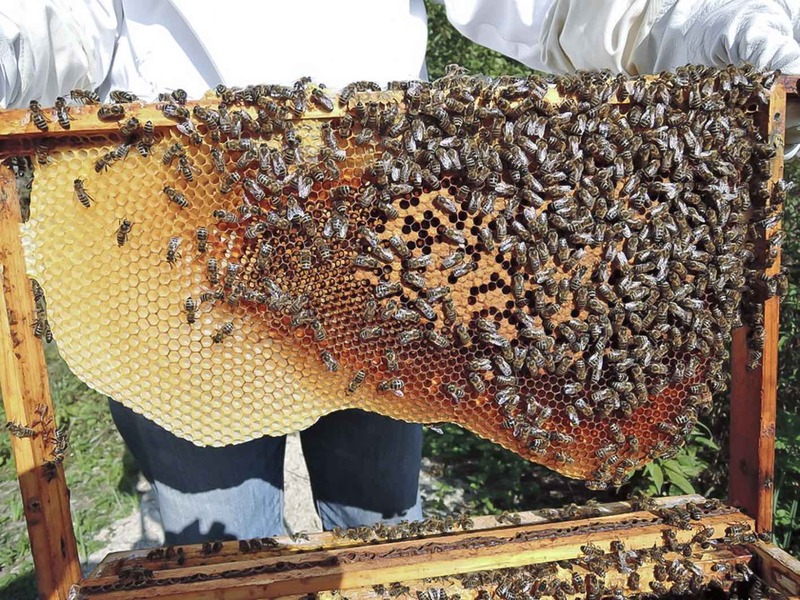 His bees uses the combs for brood efficiently. They are much more conservative, frugal with food reserves, than common Italians in America. He has always liked the darker kind of bees, Caucasian and Carniolan types. Today he has all colors. He started selecting among his bees creating his own stock many years ago. When the Russians came on the scene he started buying breeder queens of those and they changed the game concerning Varroa resistance. He refers to his friend Kirk Webster having the same experience using Russians. He uses no system for wax renewal. Well, he does in a way. After the queen breeding and nuc season is over, when a colony dwindle, for example looses its queen or having a failing queen, he doesn’t have any queen cells to save such colonies. 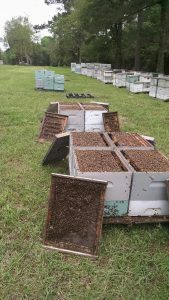 Broodnest boxes, deeps and shallows from these failing colonies go on top on other colonies as honey supers. After harvesting these boxes are extracted separately. The uncapper has adjustable cutting depths. When extracting brood combs he sets the uncapper on the deepest cut settings. It really cleans up the oldest nastiest comb. Many of his brood nest boxes stay out in the field for years, but a certain number do get extracted and thus cleaned up quite a bit. He only cull combs that look horrible or have broken frames. Most of his combs are more than forty years old. 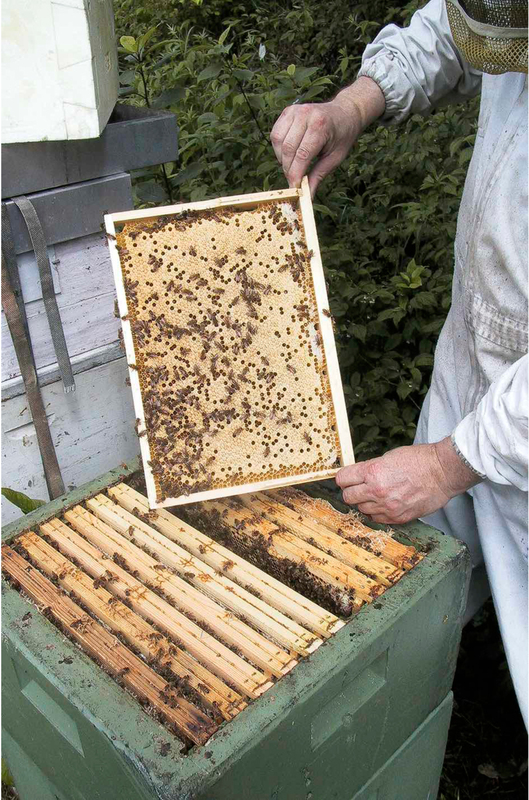 He in first place uses the extracted brood combs when making nucs. 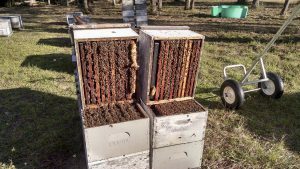 He starts the nucs with three good deep brood frames and fills up the box with extracted deep combs and maybe a food comb. This box is put on a shallow extracted box. The nuc gets a ripe queen cell and maybe a good feed. 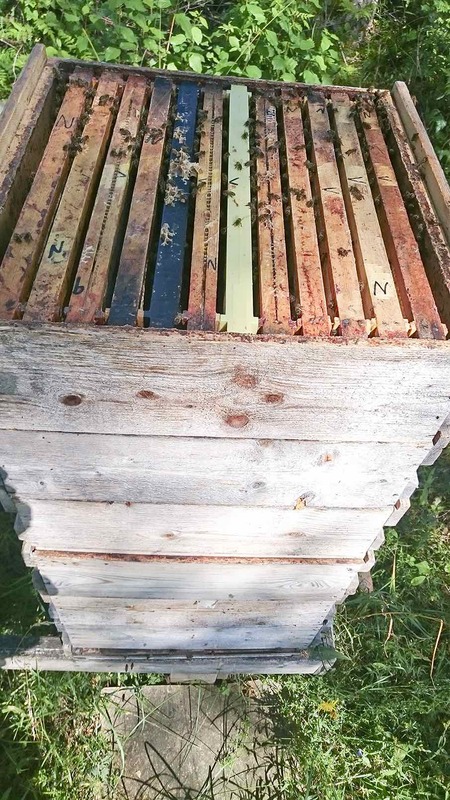 This hive setup, which has a smaller brood nest than many others use (many use two deeps), works fine in his management system. As annual losses are somewhat high (which is the “normal” average in America) many nucs are made. 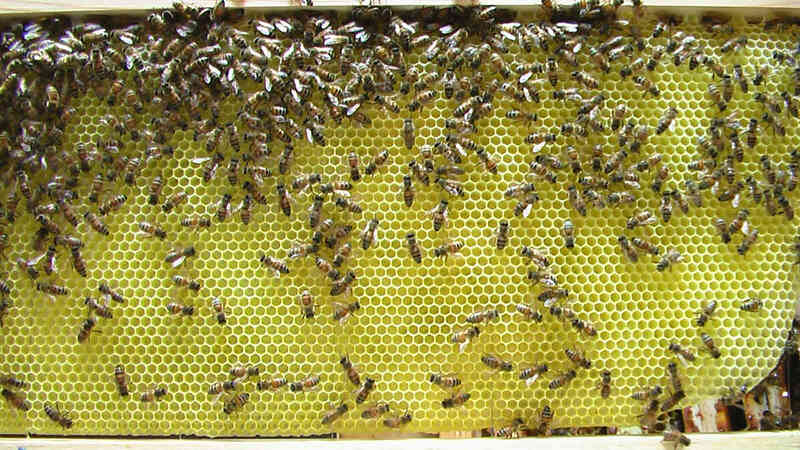 Still the colonies have time to grow to be strong enough for both pollination and honey production. And this is done just perfect with this 1 and ½ box broodnest setup. When he moves hives, he can take a bigger number, 4 stories with 4 hives on a pallet, 544 on a truckload. Chris doesn’t really care about cellsize. If he did he maybe would have to change management system when it comes to wax renewal. He hasn’t found any reason for using more labor in this part of his beekeeping. So what is the cellsize in his combs? Today when he buys wooden frames with plasic foundation (these are cheapest and quickest to get at work into the system), most common is 5.4 mm, to begin with. Forty years ago who knows, maybe 5.2 mm was what was bought, (sizes 5.1-5.6 was available). But during the years cell volume has shrinked of course due cocoon residues. When old combs have been cut down, the cell bottoms have been left untouched. The parts of the combs closest to the midribs are “smaller cell” still, by the added cocoon residues. But the compactness of a real small cell comb is not there (more cells per area unit). Beekeeping makes you nature focused and Chris often observes wildlife while working the bees. Deer, antelope, hawks, eagles, owls, praire dogs, coyotes, pheasants, grouse, badgers and so on. He once saw six bull elk out on the praire. At another time a golden eagle carried off a coyote. The land in South Dakota isn’t as flat as it appears many times, but it’s so treeless that you often can see horizon to horizon. What about next season then? Weather comes up differing with cold and heat, drought and rain. And we need rain too besides sun. Next season will always be better! 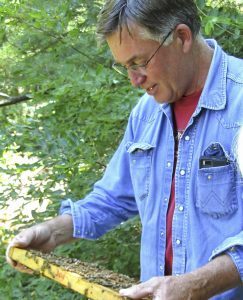 Chris Baldwin is doing his share in putting food on the table in US through his bees’ pollination services, and yes, somewhat also on many other tables around the world that import almonds. Before varroan came there could be seen occasional bees with undeveloped/deformed wings in spring. Maybe it was the influence of DWV, Deformed Wing Virus. But it may also have been chilled brood. During the final phase of the pupa development to finished bee the wings are formed. Cold nights and too much of brood could maybe have caused undeveloped wings. Today, one can probably assume that when you see a wingless bee, it’s DWV responsible. 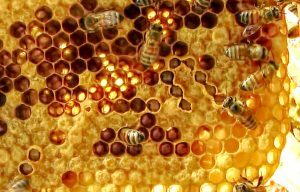 Varroa mites are paving the way for many viruses into pupae and adult bees that had not previously bothered bees. Moreover, these viruses multiply in mites. So today mites spread viruses more efficiently than when the mite had just arrived in Europe. Why that is so is another interesting discussion that probably involves the use of miticides. 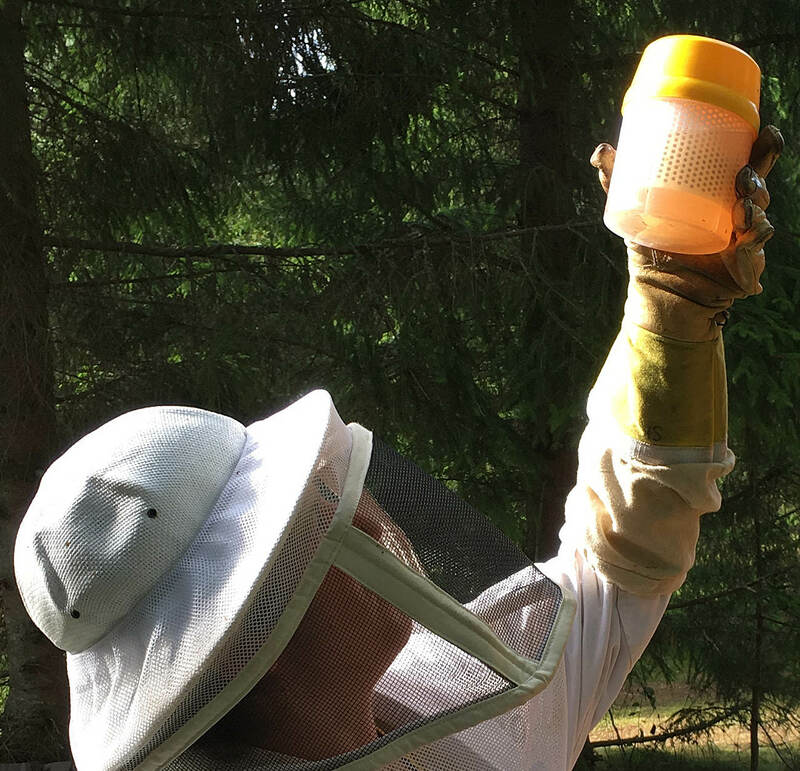 The Bee Shaker is a great way to keep track of the level of mites in the bee colony, especially in spring and late summer, so the amount of virus can be kept reasonably low by allowing people to fight the mite if it exceeds a certain degree of infestation. (If that is the strategy chosen.) 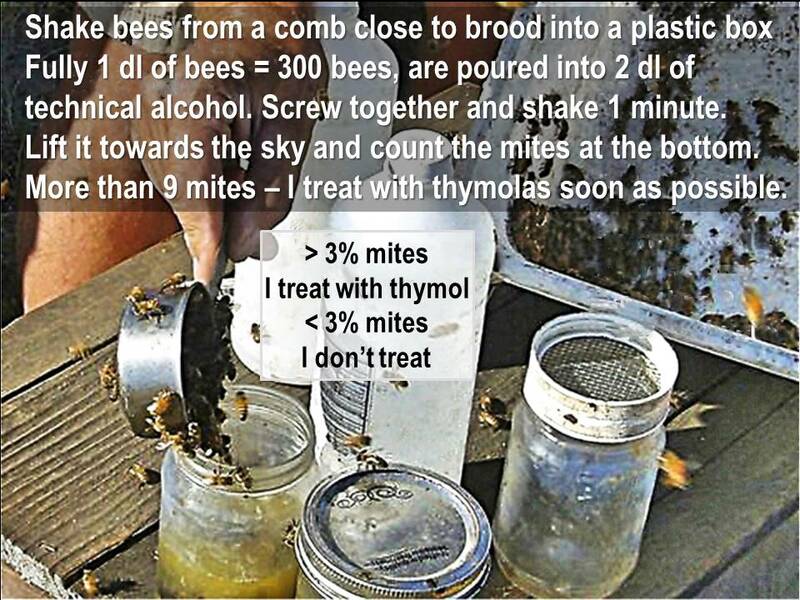 A good benchmark that many use today is 3%, three mites on one hundred bees (9 mites in 300 bees/1 deciliter of bees). It also means that to develop a bee stock towards better varroa resistance, you don’t treat against the mite, especially below a mite level of 3%, whenever in the season it is measured. But if there are wingless bees in the bee colony? It’s usually a sign of DWV and thus too many mites. Here is the Bee Shaker again a good tool, to find out if there really is a high degree of infestation of mites when you see a wingless bee. 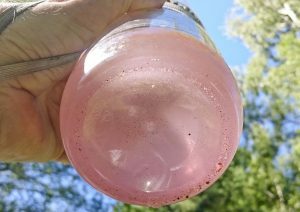 If you decide to treat against mites if the level is high you might do it to prevent the spread of mites to other colonies nearby. 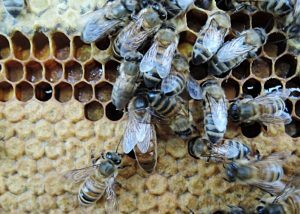 Last year’s breeder queens seem to have produced many queens that have given colonies that control the mites quite well. 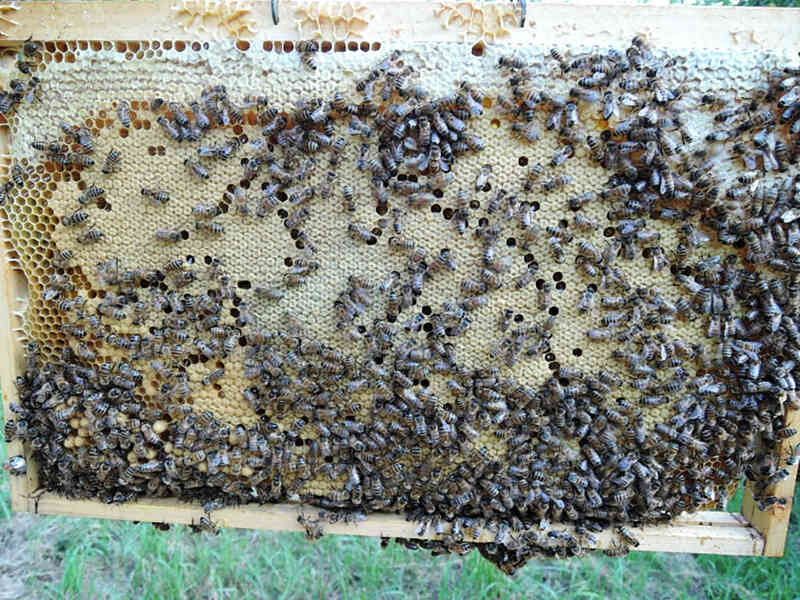 One of these daughter queens was introduced to a colony that had problems with mites. Perhaps the biggest problem was virus. This colony was quite weak in this spring and developed slowly, compared to the other colonies in the apiary. I concluded that I would have to check the brood nest to find out the cause. Maybe the colony was shifting their queen? 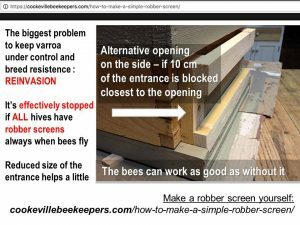 On a later visit to the apiary about June 20, I saw one, only one, wingless live bee on the hard board in front of the entrance. I then looked in the brood nest, but saw no more wingless bees on the brood frames. 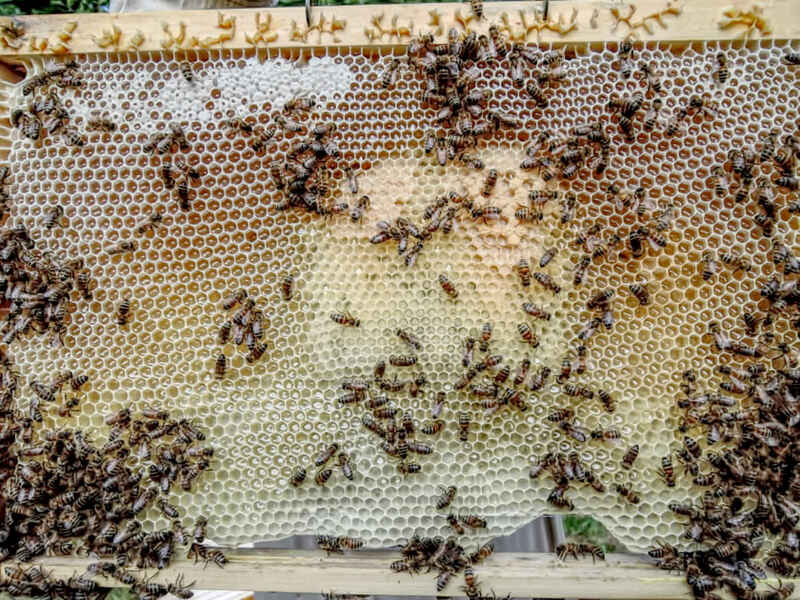 But the brood frames had a so called shot gun pattern with a lot of “holes” where you would have expected capped brood as the other cells on the comb contained capped brood. Many pupae seemed to have been removed by the bees. Most likely not due to inbreeding as the queen had mated in the apiary and the number Elgon colonies in the neighborhood was quite high. No trace of any brood disease could be seen so I concluded that a likely cause could be cleaning out of varroa-infested brood. 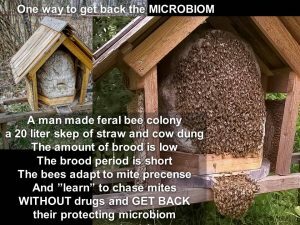 Or could the bees detect virus in the pupae and remove it, without there being a mite in the cell, and remove the pupae? The sample showed zero (0) mites! Then it’s no use to treat, There were far too few mites in the colony. Why had there been a wingless bee recently before the test? The brood frames looked less spotty and the colony stronger. July 8 I was visiting the apiary again. Once again I saw a wingless bee on the hardboard. But now I knew the Varroa level was low. Still no use treating. I looked in the brood nest. 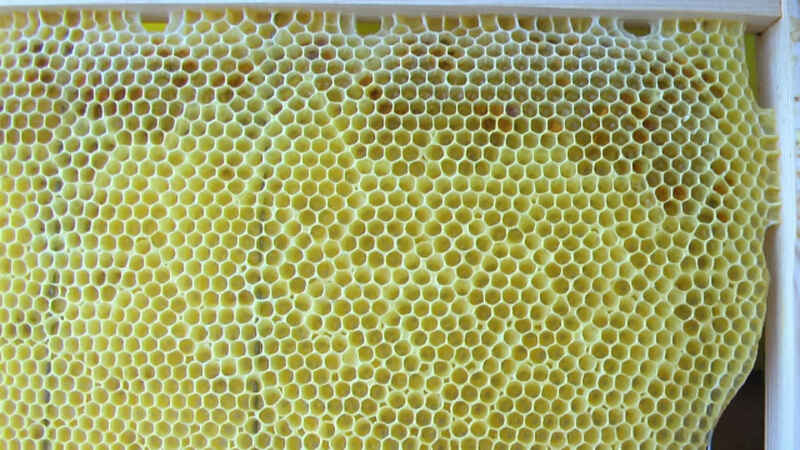 The colony was a little stronger still and the brood frames had fewer “holes”. The bees look healthy. They were recovering. Virus apparently remain in the colony for a while after mites are eradicated – by the beekeeper or the bees.